Some new and notable books arrived this year, many of which surprised me by their diversity and flat-out culinary allure. 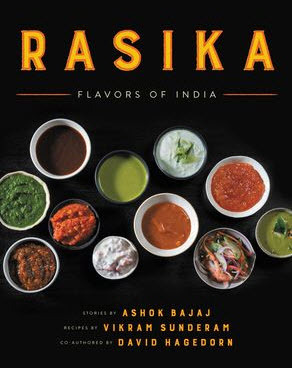 All but one are food-related, and the authors have generously consented to share some of their best recipes. See below. The following four writers are local to the DC and Chesapeake region. ~ Brian Noyes with Nevin Martell’s “Red Truck Bakery Cookbook – Gold Standard Recipes from America’s Favorite Rural Bakery” (Clarkson Potter Publishers, 2018) has some eminently do-able show stoppers just in time for the holidays, but it’s one that you’ll be returning to time and time again for both classic and re-imagined recipes that trend Southern. Noyes runs two retail stores where all the baked goods are made by hand. The one in Warrenton, VA is in a former 1921 Esso Station the other is in Marshall, VA. 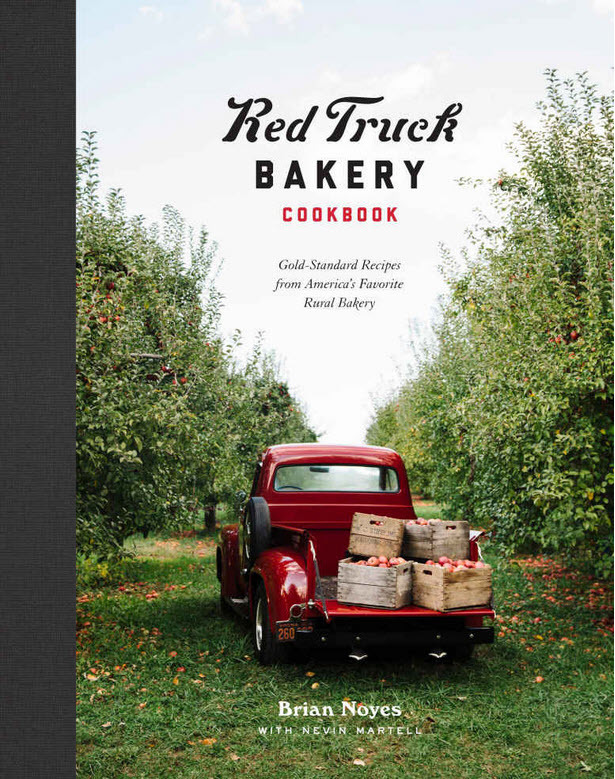 The Red Truck Bakery ships all over the country. Fun fact: The Obamas, country and folk singer Mary Chapin Carpenter, Robert Duvall and Oprah are on his client list. 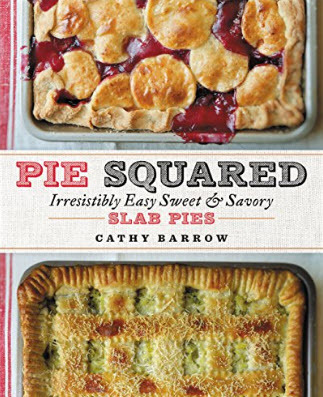 ~ You’ll want to refer often to Washington Post food writer Cathy Barrow’s “Pie Squared – Irresistibly Easy Sweet & Savory Slab Pies” (Grand Central Publishing, 2018) for quick and easy slab pies perfect for hors d’oeuvres, dinner, desserts and party fare. Barrow’s Cherry Pie was the winner of a contest at the Washington Post and her recipe for slab pie broke the internet. Pro tips: Barrow uses a baking steel or pizza stone and swears she never gets soggy bottoms! She also uses ice packs or frozen peas to cool the counter before rolling out her dough. 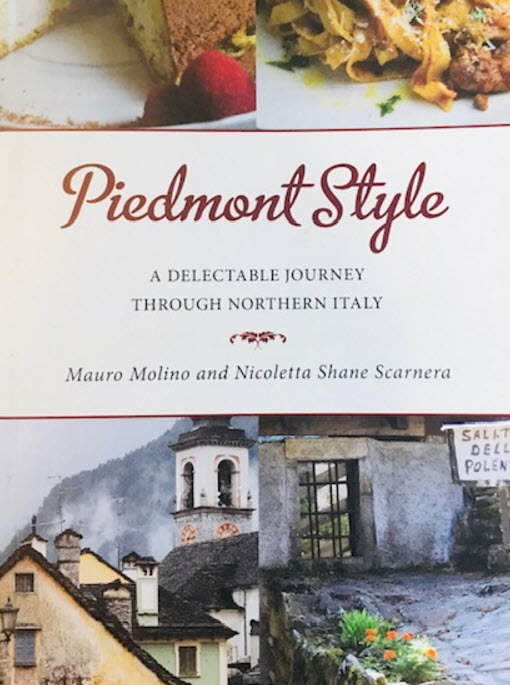 ~ Newcomers Mauro Molino and Nicoletta Shane Scarnera’s “Piedmont Style – A Delectable Journey Through Northern Italy” (2018) is the dark horse of this grouping. Molino is originally from the Piedmont region. 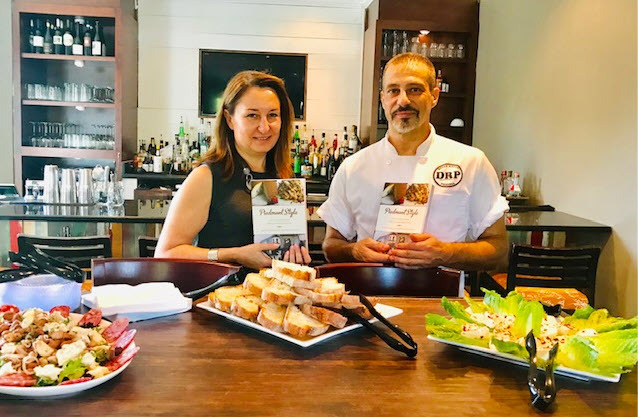 Currently Molino oversees operations at The Reserve restaurant in Alexandria, VA.
~ Renee Brooks Catacalos will be familiar to many as the former publisher of the magazine Edible Chesapeake and Deputy Director for Future Harvest – Chesapeake Alliance for Sustainable Agriculture. 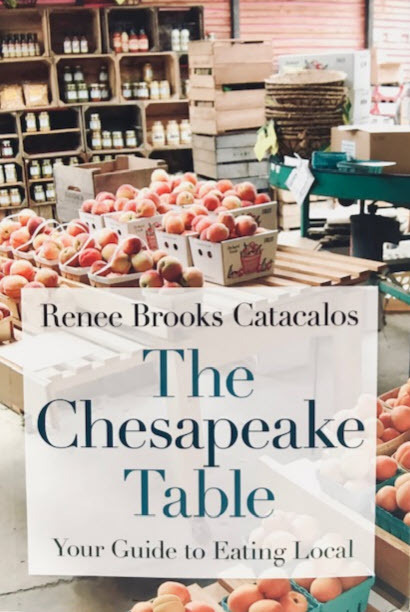 Coupled with regional recipes “The Chesapeake Table – Your Guide to Eating Local” (Johns Hopkins University Press, 2018) is a primer on local farms, breweries and distilleries in the Chesapeake region with an emphasis on environmentally sustainable practices. 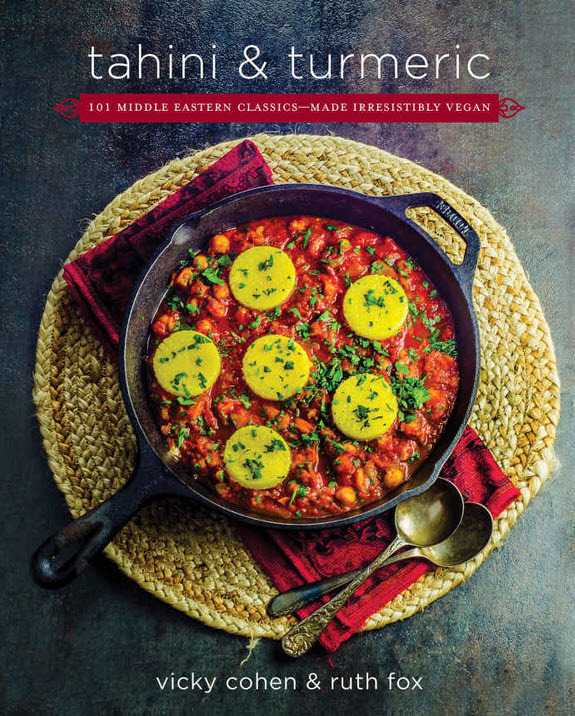 ~ From to the Middle East, “Tahini & Turmeric – 101 Middle East Classics Made Irresistibly Vegan” (Da Capo Press, 2018) by sisters and veteran food writers, Vicky Cohen and Ruth Fox, is a fresh take on Middle Eastern cooking. With grains, nuts, seeds, legumes, fruits and veggies, it has all the recipes you’ll ever need to rock out plant-based meals from Spain, Syria, Morocco, Lebanon and Israel. ~ “Cuba Cooks: Recipes and Secrets from Cuban Paladares and Their Chefs” (Rizzoli, 2018) with foreword by José Andrés, takes you into the kitchens of the private home-based restaurants “paladares” that are scattered around Cuba. 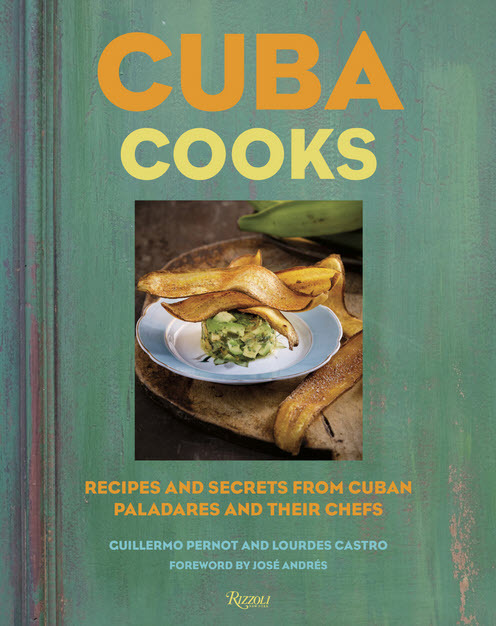 Guillermo Pernot, considered the “Maestro of Cuban Cooking” along with cookbook author and TV food celebrity, Lourdes Castro are your behind-the-scenes guides to the once imperiled cooking of this mysterious island nation. ~ Last on the list and naturally without recipes! is a fascinating read by New York Times bestselling author and full disclosure here, a personal friend, Eleanor Herman. 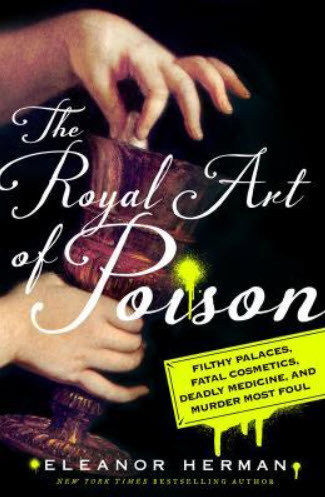 Not to be referenced while preparing meals, “The Royal Art of Poison – Filthy Palaces, Fatal Cosmetics, Deadly Medicine and Murder Most Foul” (St. Martin’s Press, 2018) is a well-researched, headlong dive into the mysterious deaths of a host of famous historical figures from Henry VII and Michelangelo to Napoleon, Mozart and more. You’ll never watch another period drama without thinking about how kings, queens and assorted royals spent their idle hours dreaming up ways to knock each other off. Along with the tales of their demise are facts and suspicions. Leave it to this multi-disciplinary writer to dish it up in an engaging, gossipy style that can make even the driest subject stand your hair on end. In a large, tall-sided nonreactive pot, combine the green bell peppers, red bell peppers, hot peppers, vinegar, sugar, and red pepper flakes and bring to a rolling boil over high heat. Add the pectin and return to a rolling boil for exactly 2 minutes to blend and develop the flavors. While the jelly is cooking, use a brush dipped in water to clean off any that bubbles up the sides and sticks to the pot. Remove the pot from the heat, let the mixture cool, and refrigerate overnight in a half-gallon jar or covered bowl to achieve a jelly consistency. The jelly will keep in the refrigerator for about 1 month. If you’d like to save the jelly for future use, sterilize 8-ounce jars, rings, and lids according to the manufacturer’s directions. Set a raised wire rack on a dishtowel or layer of newspaper. Carefully pour the jam into the sterilized jars, leaving ½ inch of space at the top of the jars. Wipe the rims of the jars clean and seal tightly. Transfer the jars to a canning pot and add water to cover by 1 to 2 inches. Boil the jars for 10 minutes, sealing them according to the manufacturer’s directions. Carefully remove the jars from the water and place on the wire rack over the towel or newspaper. Let stand for several hours until cooled. Unopened jars of jelly will keep at room temperature for about 1 year. Preheat the oven to 350°F. Coat a 10-inch Bundt pan with nonstick spray and dust it with flour, tapping out any excess. 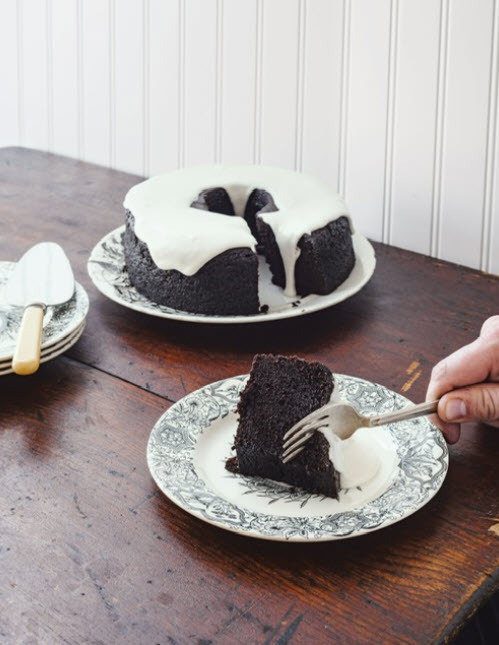 Make the cake: In a large bowl, whisk together the canola oil, Guinness, and melted butter until well blended. Whisk in the cocoa powder and granulated sugar. In the bowl of a stand mixer fitted with the paddle attachment, beat together the sour cream, egg, and vanilla at medium speed until just combined. Add the Guinness mixture and mix until combined. Add the flour, pudding mix, baking soda, and baking powder. Beat until smooth. Transfer the batter to the prepared pan. Smooth the top with a spatula. Bake for 35 to 40 minutes, turning the pan after 20 minutes, until a toothpick inserted into the center of the cake comes out clean and the middle of the cake bounces back when touched. Let cool completely, then turn the cake out of the pan onto a cake stand or platter. We’ve been making dairy-free cheesecake for years, and we’ve always used dairy-free cream cheese as our base. That is until we discovered how ground, soaked cashews have the extraordinary ability to mimic pretty much every single dairy product from ricotta to cream cheese. Cashews are incredibly versatile. In this recipe, they work beautifully with the tahini (which also adds a subtle nutty flavor), and the result is a rich and creamy cheesecake. The slightly tart pomegranate seeds cut through the creaminess of the cashew and tahini base, also providing a touch of crunch. To further accentuate the Middle Eastern flavors of this luscious dessert, we make the crust with dates and pistachios. This recipe works best when prepared in a 7-inch springform pan. You can use a bigger mold if that is what you have on hand, but take into consideration that the cheesecake will not be as tall. The leftover cheesecake can be frozen in an airtight container for up to a month. 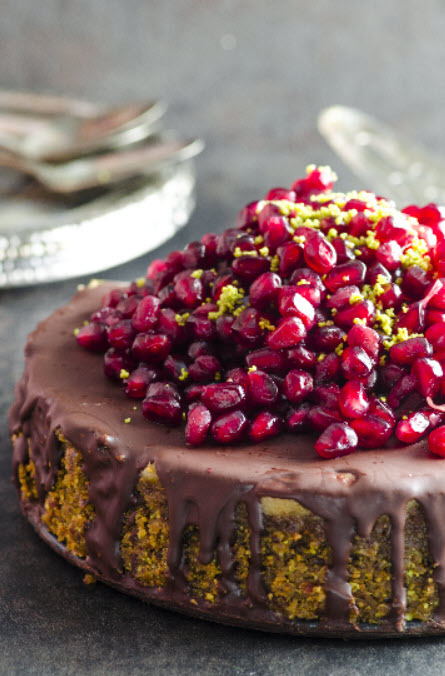 We recommend removing the pomegranate seeds from the top before freezing. Place the cashews in a heatproof bowl. Add the boiling water. Soak for 30 minutes and then drain. In the meantime, prepare the crust: Combine 1 cup of the pistachios, dates, and 1 tablespoon of tahini in a food processor. Pulse until well combined and transfer the mixture to a 7-inch springform pan. Press down evenly, so the mixture comes about halfway up the sides of the pan. Refrigerate until you’re ready to use it. Prepare the filling: Combine the drained cashews, 1/2 cup of the tahini, and the maple syrup, melted coconut oil, nondairy milk, lemon juice, and vanilla in the food processor. Pulse until smooth, scraping the sides occasionally. Transfer the mixture to a bowl and fold in the remaining 2 tablespoons of pistachios. Pour the filling over the prepared crust and freeze for 1 hour. Remove the cheesecake from the freezer and refrigerate until ready to serve. Right before serving, prepare the chocolate topping: Place the chocolate chips and coconut oil in a medium-size, heatproof glass bowl. Fill a medium-size saucepan halfway with water and bring to a boil over high heat. Lower the heat to simmer and place the bowl of chocolate over the saucepan, making sure the boiling water doesn’t touch the bottom of the bowl. Let the chocolate melt, stirring frequently. Alternatively, melt the chocolate in a microwave, at 20-second intervals on standard power until completely melted, making sure to stir well each time (this will prevent the chocolate from seizing). Drizzle the melted chocolate on top of the cheesecake. Garnish with fresh pomegranate seeds. Smoky cumin, slow-cooked sweet onions, and rich toasted nuts add so much flavor to this dish, you will never look at rice the same way again. It’s the perfect accompaniment for our Roasted Cauliflower with Green Tahini or served alongside some plain Quinoa Harissa Meatless Meatballs. This dish is best when served fresh, but you can store the leftovers in the refrigerator for up to two days. Heat the olive oil in a deep, medium-size skillet with a lid. Add the onions and cook over medium-low heat for 1 hour, or until golden brown, stirring frequently (you might need to add some water during the cooking process to prevent them from burning). Add 2 1/3 cups of water, and the salt and cumin and bring to a boil. Add the rice and stir well. Bring to a boil again, lower the heat to low, cover, and simmer for 25 minutes. Uncover the skillet and gently fluff up the rice with a fork. Replace the lid and remove the skillet from the heat. Let sit for 10 minutes. In the meantime, heat the neutral-flavor oil in a separate skillet over medium heat. Add the almonds, walnuts, and cashews and toast them for 2 to 3 minutes, stirring constantly, or until golden brown, watching them carefully to prevent them from burning. 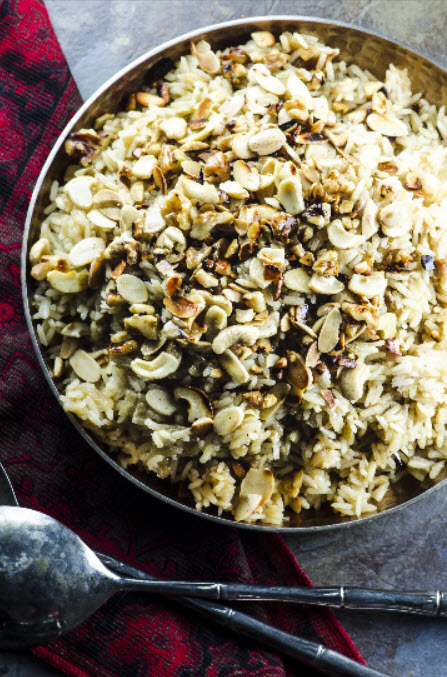 Once the rice is ready, transfer it to a large serving platter and top with the toasted nuts. Garnish with parsley and pomegranate seeds, if using. Time-saving tip – Cook the onions one to two days in advance, and refrigerate them until they are ready to be used. Excerpted from Tahini & Turmeric: 101 Middle Eastern Classics—Made Irresistibly Vegan by Vicky Cohen and Ruth Fox. Copyright ©2018. 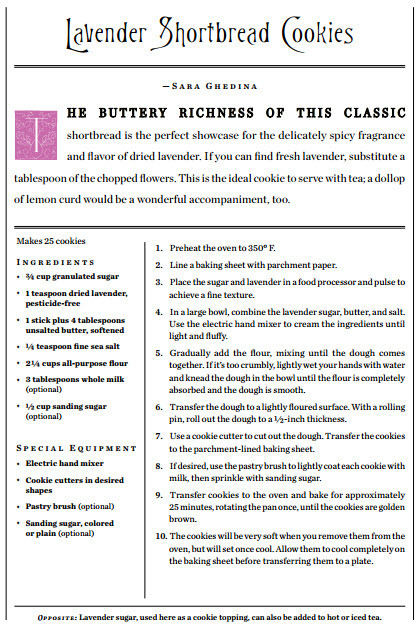 Available from Da Capo Lifelong Books, an imprint of Perseus Books, LLC, a subsidiary of Hachette Book Group, Inc.
expect some of you may slap your forehead when you read this recipe and say, “Why didn’t I think of that?” Indeed, it’s so easy and straightforward, it’s almost sinful. 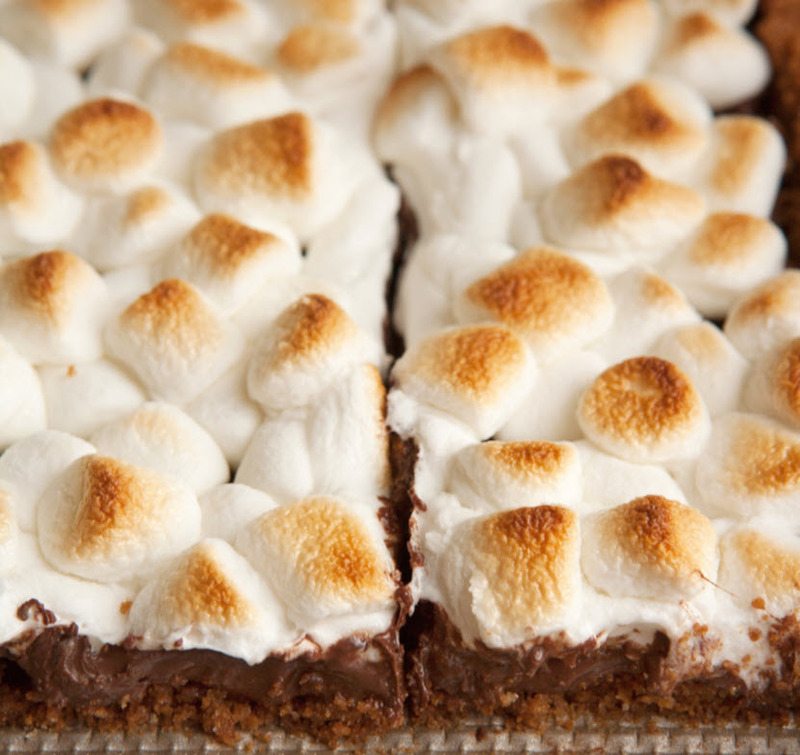 There is nothing to beat the smell of wood smoke and the fear your perfectly bronzed and oozy marshmallow will slip from the stick, but this S’Mores Slab stands in when the campfire is miles away. This pie must be baked on top of a hot surface to achieve a firm base. Make Ahead: The crust may be baked and the chocolate layer spread over the crust a day or two in advance. Keep refrigerated until ready to add the marshmallows. 5 cups (10 ounces, 285 g) mini marshmallows . For the crust: Heat the oven to 350F and place a baking stone, Baking Steel, or inverted baking sheet on the center rack to heat. Place the graham crackers in a ziptop bag and bash them with a rolling pin until they are in small pieces but not powdered, or use your hands to crush them. Mix the cracker crumbs, butter, sugar, and salt together using your hands or a firm silicone spatula. Knead and press the mixture until it is cohesive and the crumbs are thoroughly buttered. Dump the dough into the slab pie pan and press across the bottom, but not up the sides of the pan. Press down using a metal cup measure, or the flat bottom of a glass, until the crust feels firm to the touch. Slide the pan into the center of the oven, on top of the steel, stone, or baking sheet, and bake until lightly browned, about 10 minutes. To fill the pie: Remove the crust from the oven; it will still feel damp and soft. Immediately scatter the chocolate chips evenly across the surface of the pie and pop the pie back into the oven for no more than 2 minutes, until the chocolate is softened. With an offset spatula, spread the chocolate evenly across the crust. Refrigerate for at least 2 hours or up to 2 days. Place a rack at the top of the oven and heat the broiler to high. Scatter the marshmallows thickly across the top of the pie. Slide the pan under the broiler and watch carefully. It takes about 2 minutes to brown beautifully. It takes about 4 minutes to incinerate. While still hot from the oven, warm a long slicing knife under hot water, make a cut and, wiping and warming the knife between each subsequent cut, portion the pie into serving pieces. • Try bittersweet chocolate instead of semisweet. • A swipe of caramel atop the crust and below the chocolate is, plain and simple, naughty. Make ahead – Combine the filling ingredients up to one day ahead. Heat the oven to 400F; if you have one, place a baking stone, Baking Steel, or inverted baking sheet on the center rack to heat. the parsley, chives, garlic, lemon juice, and pepper and scoop into the chilled bottom crust. Cut lattice strips from the chilled top crust. Spread the filling evenly in the bottom crust and lattice the top. until the filling is bubbly and the crust is browned and glossy, 45 to 50 minutes. Cool slightly before serving. Add a small can of green chiles or small jar diced pimentos, drained, to the filling—or add both. 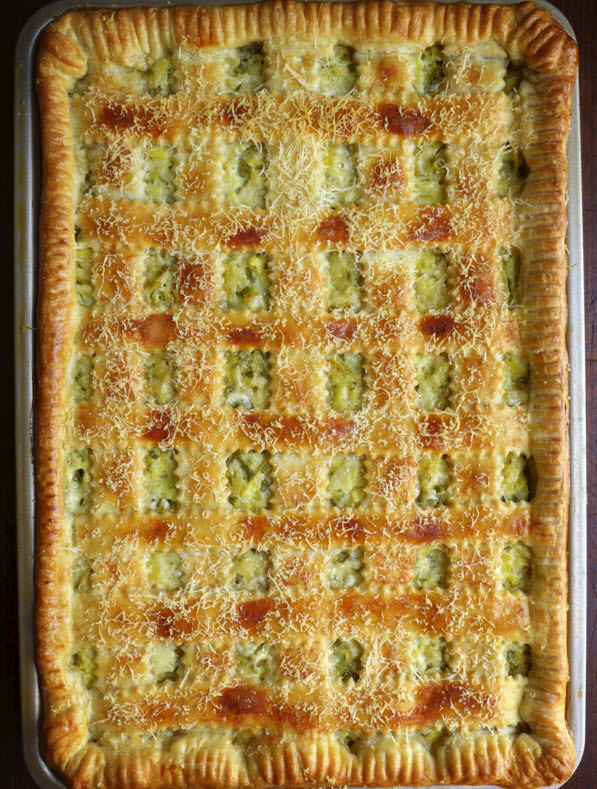 Excerpted from the book PIE SQUARED: Irresistibly Easy Sweet & Savory Slab Pies by Cathy Barrow. Copyright © 2018 by Cathy Barrow. Reprinted with permission of Grand Central Publishing. All rights reserved. I’ve been eating arroz con pollo, the ubiquitous chicken and rice dish served at Cuban family gatherings, for as long as I can remember. And while I’ve had many delicious versions, chef Iván’s is undoubtedly the best I’ve tasted. I strongly suggest you do not neglect the last step, which instructs you to pour beer over the cooked dish. The beer mixes with the chicken juices and creates an incredibly tasty sauce. Place the chicken stock and bouillon cube in a saucepan over medium heat. Simmer until the bouillon cube is fully dissolved. Set the broth aside. Season the chicken pieces with the salt. 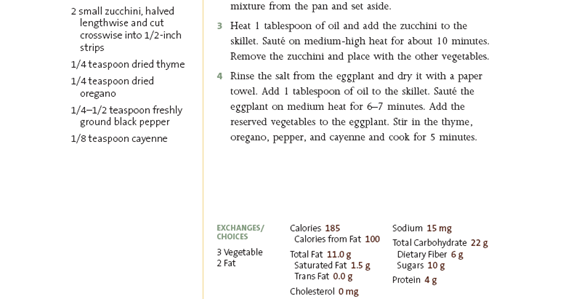 Heat the olive oil in a wide sauté pan or cazuela (a terra-cotta cooking vessel) over medium heat. Add the chicken pieces and cook just until brown on both sides, about 5 minutes. The chicken should not be cooked through. Remove the chicken to a plate and set aside. Add the onion to the pan and sauté it until it turns limp and translucent, 2–3 minutes. Stir in the garlic, cumin, and bay leaf and cook until fragrant, about 2 minutes more. Stir in the green and red peppers and the grated tomato and simmer for a couple minutes, then add the rice and saffron, along with its soaking water, to the pan. Return the chicken pieces to the pan, making sure to nudge them into the rice. Pour the reserved chicken broth over the chicken and rice and bring to a simmer. Taste the broth and season with salt if necessary. Once the broth is simmering, reduce the heat to medium-low and cook, covered, for 20 minutes. Sprinkle the peas over the chicken and cook for another 5 minutes. Right before serving, drizzle the beer evenly over the pan and garnish with the eggs and tomato wedges. Oysters are incredibly rare in Cuba, as their stocks have been practically wiped out. However, on one particular day we saw a fisherman entering the paladar where we were seated with a bag of mangrove oysters. These Caribbean oysters grow in clumps on the roots of mangroves, the shrubs that grow in coastal seawater. Mangrove oysters are smaller, plumper, and less briny than the cold-water variety. When presented with this ingredient, the chef decided he’d prepare this oyster ceviche for us, and we loved it. Feel free to use your favorite oyster in this recipe. Heat the oil together with two tablespoons of butter in a large flat skillet; add the onions and sauté until they become translucent; add the rice and toss for a few minutes to allow each grain to be coated by the oil and butter. Pour in the wine and reduce all the way; add the pumpkin, mixing well. Little by little add the hot broth and let it be absorbed before adding some more. Simmer for 15 to 20 minutes, mixing very frequently to avoid the rice sticking to the bottom of the pan. Season to your taste. When cooked, remove from the heat, add the Gorgonzola cheese, Parmesan cheese and the remaining two tablespoons of butter; mix well. Serve hot. 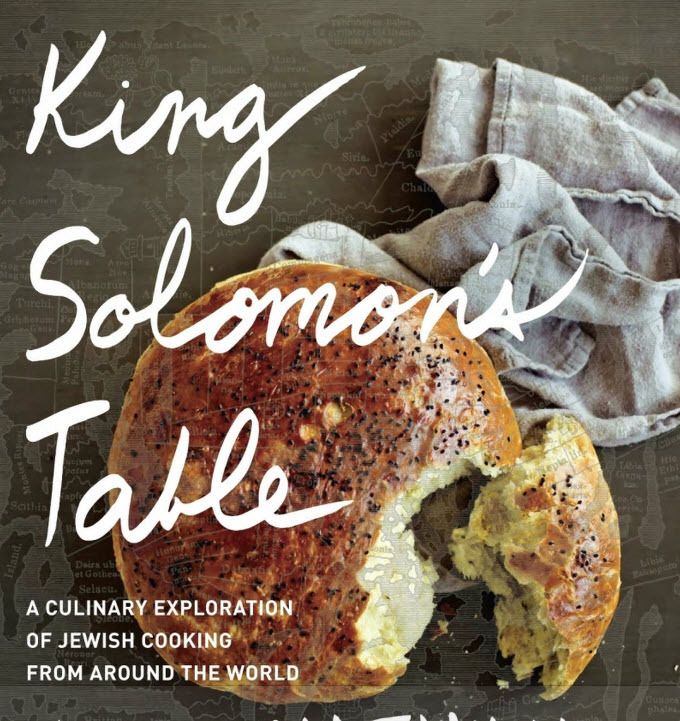 If there’s a theme to this year’s crop of food and spirits books, it’s ethnically-driven, historic and authentic – with a dollop of fantasy. 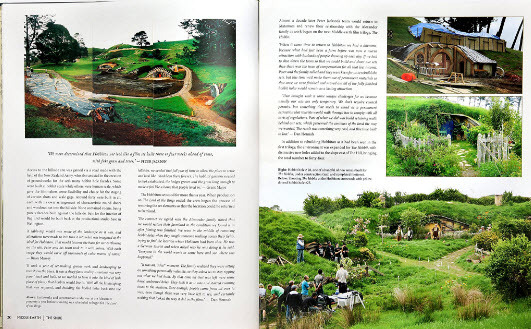 Like travelogues, they offer an authentic glimpse into the past. 1. Preheat the oven to 375 degrees and line a baking sheet with foil. Put the whole chiles on the baking sheet and roast for 40 minutes to an hour, flipping every 20 minutes, until the chiles are blackened all over. Let cool and then remove the stems and skin from each chili, leaving them as intact as possible. Then cut a slit almost the full length of each chili and carefully pull out the seeds. Put a piece of cheese inside each chili. 2. While the chiles are roasting, make the latkes, keeping the potatoes in cold water until ready to grate them. potato mixture from blackening.) When you have finished, put the potato and onion mixture into a clean dish towel and squeeze out the water into a medium bowl, allowing the potato starch to settle at the bottom. Carefully pour off the water, but leave the potato starch at the bottom of the bowl. 4. Once the liquid has been drained, put the potato mixture back in the bowl with the potato starch that has accumulated in the bottom. Add the egg, the breadcrumbs or matzo meal, and salt and pepper to taste and mix well. THE SIOUX CHEF’S INDIGENOUS KITCHEN – Sean Sherman with Beth Dooley (University of Minnesota Press 2017). 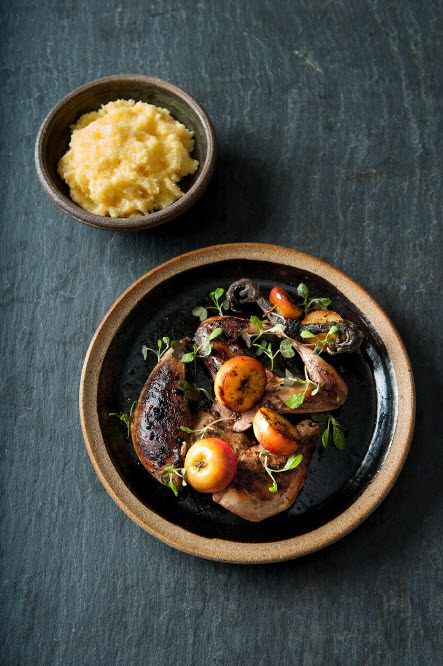 Famed Oglala Dakota chef, Sean Sherman, brings his years of experience foraging game, fish and wild ingredients for authentic Native American fare to his first cookbook. I have been vicariously following Sherman’s nationwide nose-to-tail dinners on Facebook throughout the year, especially a six-course dinner at the James Beard House. When I was growing up on the Pine Ridge Reservation, we stocked our freezers with pheasant and grouse. We’d see them darting across the dirt roads into the dry brush. They were as common as the red-winged blackbirds perched on the fence posts. Overnight dry brining seasons and helps this especially lean bird to become tender and succulent. The technique also works with grouse and guinea hens. The day before, rinse the pheasants and pat dry with paper towels. To dry-brine, generously season with the salt, maple sugar, sumac, and juniper. Place on a roasting pan or deep plate in the refrigerator, uncovered, overnight. Preheat the oven to 500°F. Place the pheasants breast side up in a medium roasting pan. Rub a generous amount of the duck fat under the skin of the birds and over the outside of the skin. Put half the cranberries into the cavity of the pheasants and spread the rest in the pan. Pour the stock and vinegar into the roasting pan. Roast for 15 minutes. Reduce the heat to 350°F and baste the pheasants with the pan juices. Continue roasting until the skin is crisp, the juices run clear, and a meat thermometer inserted in the thigh reaches 155°F, about 30 to 45 more minutes. Allow to stand at least 10 minutes before carving. Carve and drizzle with the pan juices before serving with the griddled apples. Substitute 2 tablespoons cider vinegar and 1 tablespoon maple syrup for the maple vinegar. For the griddled apples, slice the apples in half horizontally, brush with a little sunflower or walnut oil, and griddle cut side down in a hot skillet or frying pan until lightly browned, about 3 to 5 minutes. Carefully remove all the skin and fat from the duck breasts, cutting close to, but not touching, the meat. Once the fat and skin are removed, cut into 1-inch chunks. Place the skin, with its fat, into a heavy-bottomed skillet or Dutch oven. Set the pan over low heat and slowly cook, stirring occasionally, until the skin has crisped and its fat has changed to liquid, about 45 minutes. With a slotted spoon, remove the crisped skin (cracklings) and drain them in a bowl lined with paper towels. Allow the liquid fat to cool to room temperature, then strain through a fine-mesh sieve lined with cheesecloth into a bowl or a clean glass jar. Save the corncobs after you’ve enjoyed boiled or roasted corn on the cob or you’ve cut the kernels for use in a recipe. Put the corncobs into a pot and cover with water by about 1 inch. Bring to a boil and partially cover. Reduce the heat and simmer until the stock tastes “corny,” about 1 hour. Discard the cobs. Store the stock in a covered container in the refrigerator or freezer. Juniper and cedar are aggressive flavors, so add seasoning with a light touch. You can always add more later on. Then add enough water to cover the ingredients completely and set over a low flame until the stock is flavorful. Cooking time will vary depending on the amount of liquid and the ingredients, but most stocks require cooking at least 2 to 3 hours. These are our go-to cakes for breakfast, as a snack, and as the base for a well-seasoned bison braise or duck. 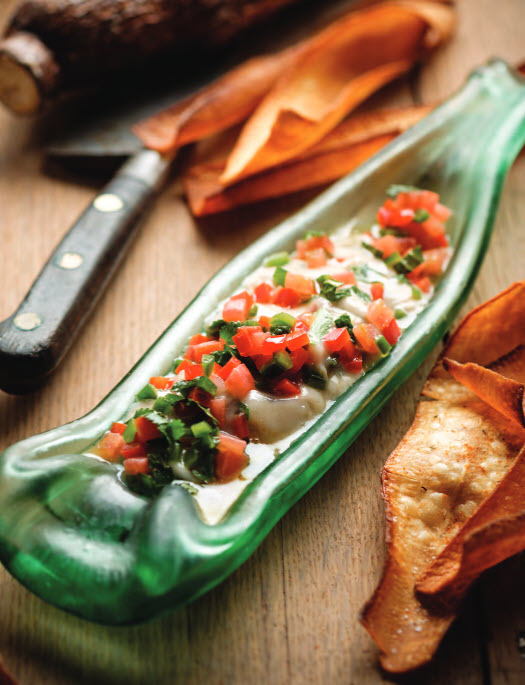 They’re especially good topped with smoked fish and our bright lemony Sorrel Sauce, page 64. 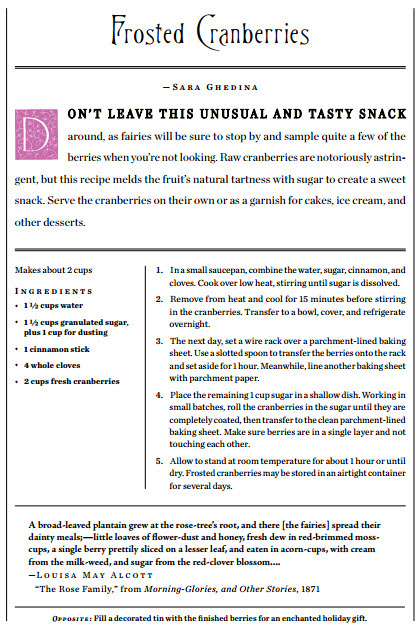 Make them tiny for an appetizer or big for dessert slathered in maple-berry sauce. The recipe for these couldn’t be simpler. It’s just overcooked wild rice, pureed into a thick dough. We like to stir in a little cooked wild rice for texture. Once shaped, these will keep several days in the refrigerator, so feel free to make them ahead. Leftovers may be re-crisped in a low oven until warmed through. 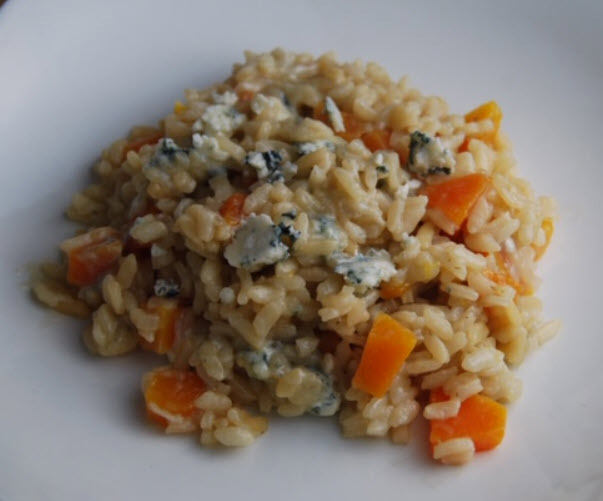 Put 1½ cups cooked wild rice and water into a saucepan, reserving ½ cup. Place over high heat, bring to a boil, and reduce the heat to a simmer. Cook until the rice is very soft and the water has evaporated. Drain. In a food processor fitted with a steel blade, puree the rice into a sticky dough. Place the dough into a medium bowl and work in the salt, sugar, and the remaining cooked rice. Scoop out a scant ¼ cup dough for each patty and shape to rounds about ½ inch thick. Heat the oil in a heavy skillet and brown the patties about 5 to 8 minutes per side until lightly browned. 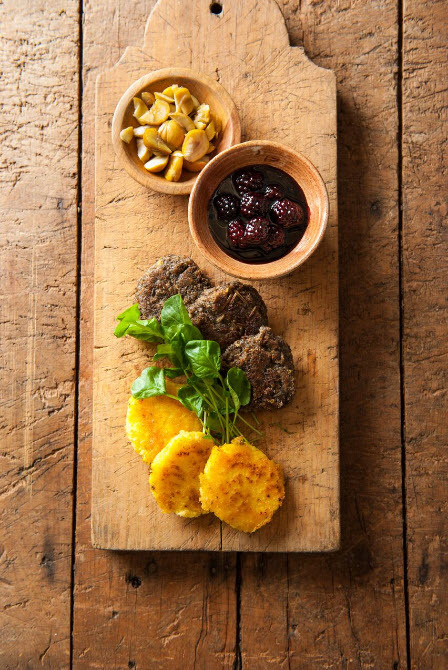 Transfer the patties to a baking sheet and place in a warm oven until ready to serve. This rich, flavorful soup has a creamy texture without cream. We use the small, tart crab apples that grow in backyards and along the borders of farm fields. Heat the oil in a deep, heavy saucepan over medium heat and sauté the onion, squash, and apple until the onion is translucent, about 5 minutes. Stir in the cider and stock, increase the heat, and bring to a boil. Reduce the heat and simmer until the squash is very tender, about 20 minutes. With an immersion blender or working in batches with a blender, puree the soup and return to the pot to warm. Season to taste with maple syrup, salt, and sumac. 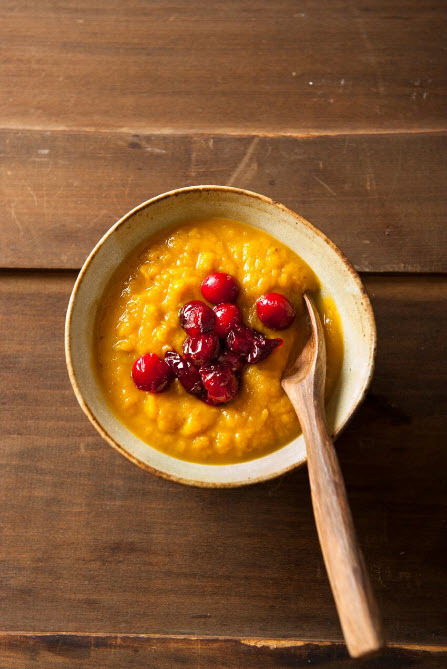 Serve with a dollop of Cranberry Sauce. Recognition for his decades-long efforts as chef and educator has been given by National Public Radio, Guardian UK, Saveur and the New York Times. Sherman has just started a non-profit, NATIFS.org (or North American Traditional Indigenous Food Systems). In an email from last week, Sherman shared his exciting news. “We are actively fundraising, searching for an Executive Director, and looking for the building that will be an Indigenous Food Hub and the heart of the non-profit. 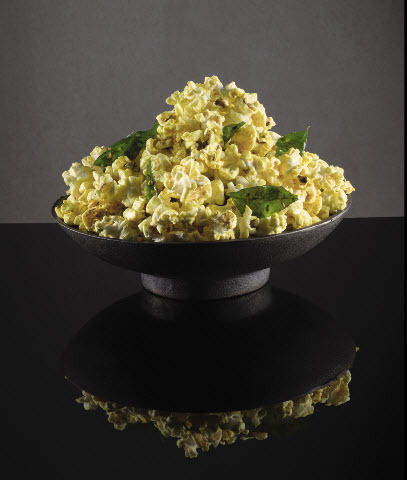 This popcorn, which we offer with drinks in Rasika’s cocktail lounge, is a take on the indian snack chiwda, a sweet and savory mix often made with fried poha (puffed rice), dried fruit, nuts, spices, and herbs. There are many ways to make it and people add whatever they like—maybe corn flakes, coconut chips, chana dal. It’s a mainstay during Diwali, much like you’d have Chex Mix during the American holiday season. If you don’t want to use the microwave popcorn, make it the old-fashioned way, following directions on the package of kerneles to make 6 cups of popcorn. 10 (1 ½ inch) fresh curry leaves (more if smaller), whole or cut crosswise into thin strips. Place the popcorn in a large bowl. This is a riff on a Goan dish called chicken cafreal, which was brought to Western India by the Portuguese from their African colonies. 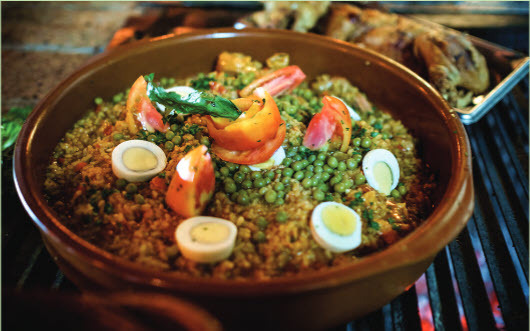 (Cafreal is a Portuguese word meaning “in the African way.”) In the traditional recipe, chicken, whole or cut into bone-in pieces, is marinated in spicy green masala paste and then roasted. We decided to use the same ingredients and flavors, but to cut the chicken into bite- size, boneless pieces. This makes a much cleaner presentation and provides plenty of sauce for rice and bread. 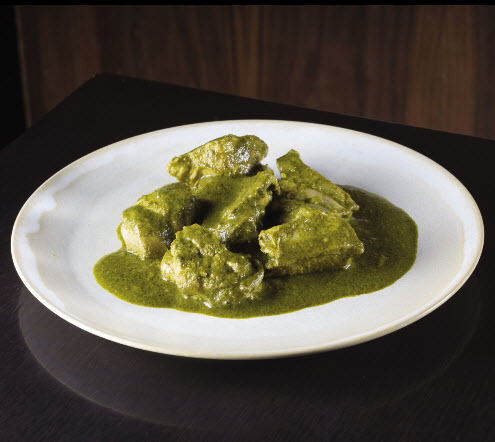 Despite its spiciness, or maybe because of it, Chicken Green Masala is one of the most popular dishes at Rasika. Cooking the chicken uncovered rather than covered after the cilantro puree is added helps maintain its brightness. For optimal flavor, make this dish many hours in advance, preferably the day before, and reheat it, although the sauce’s color will become darker. MAKE THE CILANTRO PUREE: In a blender, combine the cilantro, mint, green chilies, garlic, turmeric, lemon juice, and water and blend on high speed to make a smooth puree. Run the blender for several minutes; the finer and smoother the puree, the better. MAKE THE CHICKEN: In a spice grinder, grind the cardamom pods, cloves, and cinnamon stick into a powder. In a heavy- bottomed pot or Dutch oven, heat the oil over medium- high heat until it shimmers. Sauté the onion, stirring frequently, until soft but not browned, about 3 minutes. Stir in the chicken, turmeric, and salt. Cover the pot and parcook the chicken for 5 minutes, stirring occasionally. Stir in the cilantro puree, coconut milk, and cardamom/clove/cinnamon powder and bring to a boil. Cook uncovered for 5 minutes, stirring occasionally, until the chicken is cooked through. Serve with cucumber raita, rice, and naan. Night befo’ dem barbecues, I used to stay up all night a-cooking and basting de meats wid barbecue sass [sauce]. It made of vinegar, black and red pepper, salt, butter, a little sage, coriander, basil, onion, and garlic. Some folks drop a little sugar in it. On a long pronged stick I wraps a soft rag or cotton fer a swap, and all de night long I swabe dat meat ’till it drip into de fire. Dem drippings change de smoke into seasoned fumes dat smoke de meat. We turn de meat over and swab it dat way all night long ’till it ooze seasoning and bake all through. Bring sugar, syrup, and butter to a boil, then let cool. Add the milk slowly, stirring constantly. Pour evenly over the top of the warm cake. Much of the sauce will sink in, but you will get a beautiful shiny glaze over the top. As the owner of the pink-and-pistachio colored bespoke bakery Butter Baked Goods in Vancouver, Canada, Rosie Daykin is realizing her dream. After ditching a successful career as an interior designer, Rosie returned to her lifelong passion turning her pretty cabbage rose-wallpapered bakery café into a worldwide business enterprise. In her first cookbook, Butter Baked Goods – Nostalgic Recipes from a Neighborhood Bakery (Alfred A. Knopf 2015), Rosie shares secrets of some of her most irresistible delicacies dividing chapters into breakfast indulgences, pies, classic cakes, muffins, cookies, bars, brownies and cupcakes. There are recipes for butter creams and frostings, and even her coveted recipe for Butter’s famous gourmet marshmallows found at over 300 retailers across North America. 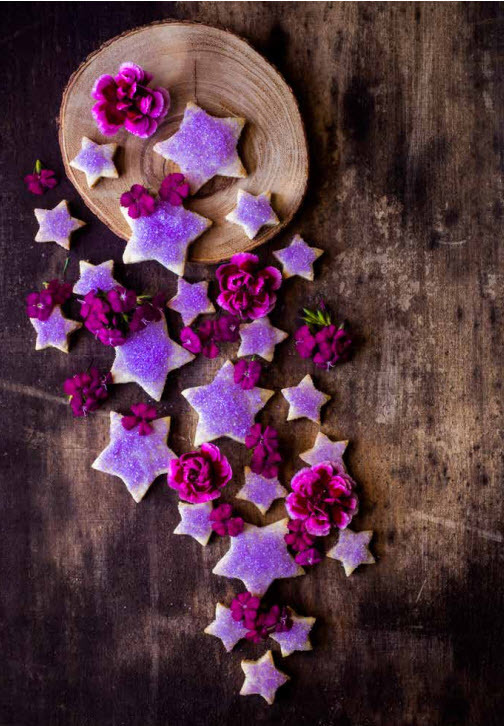 What I loved about this book is Janis Nicolay’s soft focus photographs of dozens of Rosie’s simple homemade desserts like Sticks and Stones Cookies, Chocolate Nutella High-Top Cupcakes, Bumbleberry Pie and Butterscotch Maple Pecan Scones. 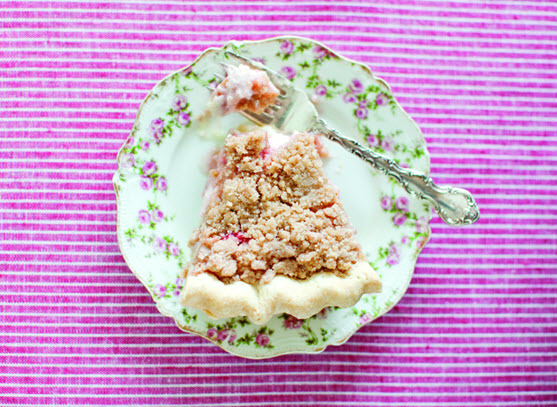 Just in time for spring, we’ve giving you her recipe for Sour Cream Rhubarb Pie. Happy baking! In a large bowl, combine the sugar, flour and salt. In a separate bowl, whisk together the eggs, sour cream and vanilla, then add to the flour mixture. Place the rhubarb in the prepared pie shell. Pour the egg and flour mixture evenly over the top. Bake in the preheated oven for 10 minutes. Lower the oven temperature to 350°F and bake for 30 minutes more. Meanwhile, in a small bowl, combine the ingredients for the crumb topping and mix with a fork until crumbly. Remove the pie from the oven and sprinkle the crumb top­ping over the top. Return to the oven to bake for another 15 minutes or until the topping is lightly browned. Remove from the oven again and allow the pie to cool slightly before slicing. 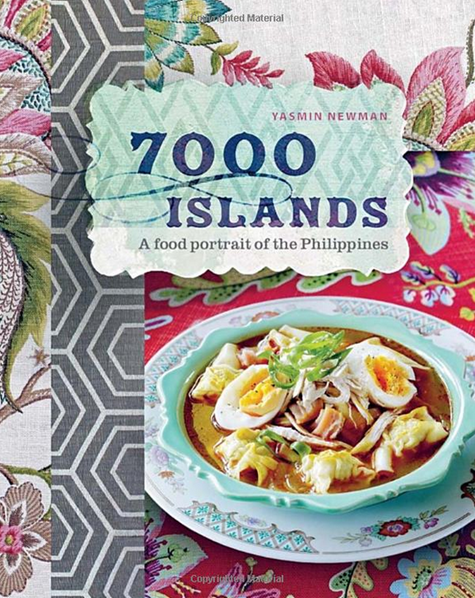 One of the most beautiful and evocative cookbooks to cross my path of late is the recent issue 7,000 Islands – A Food Portrait of the Philippines by Australian-Filipino food and travel writer Yasmin Newman. 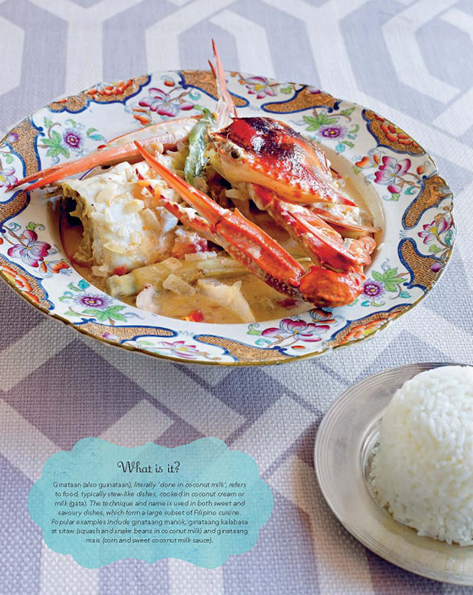 A lavishly photographed and comprehensive collection of recipes from around the islands of Southeast Asia, it is especially relevant as we see more and more restaurants opening that feature Asian cuisine. In it Newman takes us to exotic locales to offer up dishes that can be prepared in our own kitchens. Of all the 323 pages of recipes I chose this one, which is a unique way of preparing our Maryland Blue Crabs. Crab and young coconut ginataan One of the most resounding memories I have of the Philippines is of regularly eating crab; the expensive crustacean is a rare treat in Australia. My cousins occasionally enjoy it for breakfast when an affordable batch of live crabs arrives home from the morning market or is received as a gift. The bright orange shells splash colour across the table and we prise the sweet crabmeat from within. Dinner or dinner-party dish, it depends on the price of crab near you. Either way, it’s special. It’s also incredibly quick to prepare. If you prefer, ask your fishmonger to clean the crab for you. To prepare each crab, lift the triangular tail flap on the underside of the body and gently but firmly pull down to release the top shell. Remove and discard the flap, reserving the top shell. Remove and discard the spongy, finger-like gills, then replace the shell. Cut the body in half. Using a nutcracker or the blunt edge of a large knife, crack the large claws. Heat the vegetable oil in a large, deep saucepan over medium heat. Add the ginger and cook for 1 minute, stirring until fragrant. Add the onion and cook for 2 minutes, then add the tomato and cook for a further 3 minutes, stirring and pressing until the tomato starts to break down. Add the lemongrass, chillies, stock and coconut milk to the pan, season with freshley cracked black pepper, then bring to a simmer over medium-high heat. Add the crab, reduce the heat oto medium, and continue to cook for a further 8-10 minutes, turning over the crab pieces halfway – the crab is cooked when the shell changes colour and the meat turns white. Using tongs, remove the crab pieces to a serving bowl. Add the coconut cream and young coconut meat to the pan, increase the heat to medium-high , and cook for 1-2 minutes, stirring often, until slightly thickened. Remove from the heat, discard the lemongrass and chillies, if desires, and pour over the crab. Serve with steamed rice. When seasoned food writer and four-time James Beard Award-winner Ruth Reichl debuts her first novel (two more are planned), foodies everywhere sit up and take notice. The former restaurant critic, first at the LA Times – – later a six-year stint at the New York Times, is better known for bestselling memoirs like Comfort Me with Apples, Tender at the Bone and Garlic and Sapphires, books that seamlessly blended essays with recipes. In Delicious! 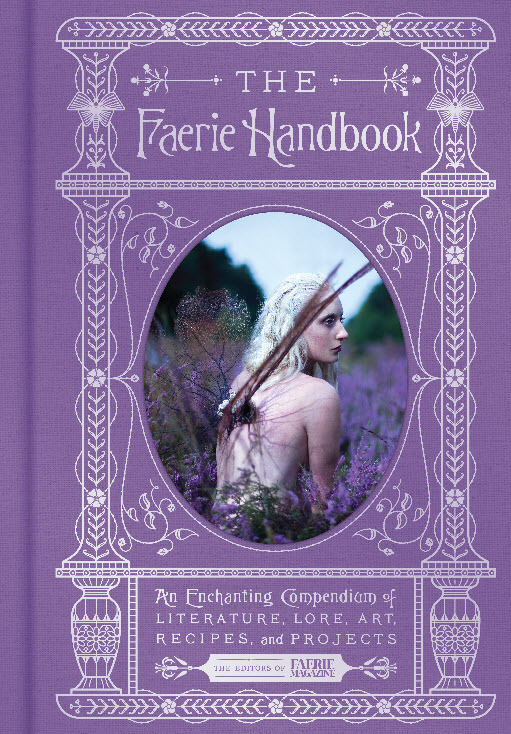 (Random House 2014) she proves she can cook up a tale as eloquently as penning a review. Reichl’s keen insight and food knowledge lend authenticity to a storyabout an aspiring young writer who leaves her family for an entry-level job at a bespoke food magazine that soon after goes belly up. Though she claims her characters evolved on their own, “Over time, all the characters claimed their own territories, refusing to do the things I wanted them to do, taking on their own strong voices”, Reichl’s ten years as Editor-in-Chief of the much beloved, and sorely missed, Gourmet magazine, inform their motivations through every twist and turn. Oh, the parallels! This light-hearted mystery will intrigue the reader with its ethno-botanical references, intriguing anagrams and culinary clues. Did you know that NYU’s Fales Library had eclipsed Radcliffe’s as America’s largest collection of antique cookbooks? Just one of the little known facts where Reichl reveals her insider’s savvy on epicurean esoterica. The story is filled with the adventures Billie Breslin and her discovery of a trove of wartime letters between the mysterious Lulu and James Beard. Yes! Reichl has channeled the august James Beard who offers his kindness and wisdom to the budding journalist. Other colorful characters are drawn from Reichl’s vast experience with food emporia and her years in the New York publishing world. When Breslin takes a weekend job at a Greenwich Village cheese shop, you’ll swear you’re on Bleeker Street buying mozzarella di bufala at Murray’s Cheese. 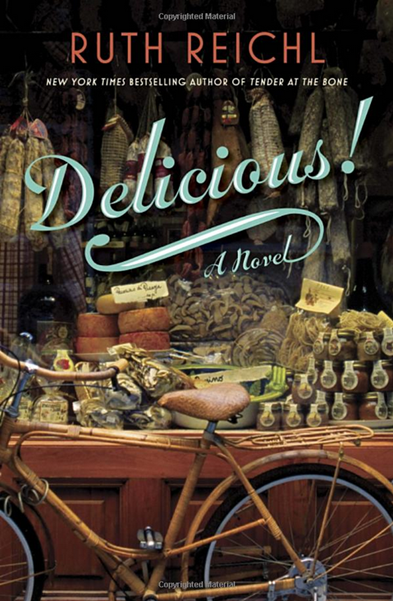 Reichl will be speaking and signing Delicious! at DC’s Politics and Prose on May 29th. Getting a fresh start on the season once meant foraging for whatever wild edibles popped out of the ground. 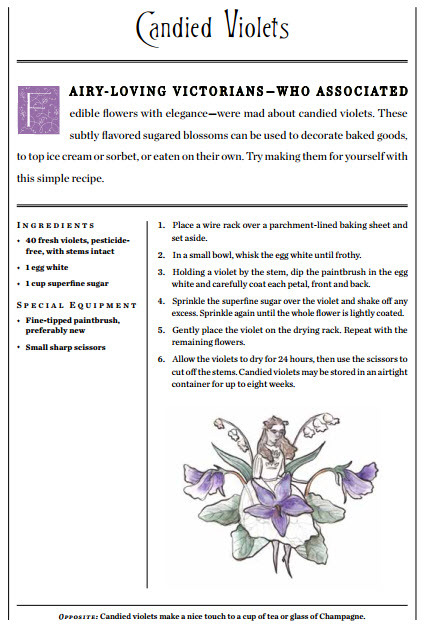 That means spring sprouters like ramps, violets, redbud flowers, tulip petals (not wild but certainly edible especially when stuffed with herbed goat cheese), mint, the tender shoots of the greenbriar, young dandelion leaves and the lovely morels and chanterelles found in leaf-strewn woods. If you live near a stream, or even a roadside culvert, chances are you’ve already found watercress for your salads and tossing in a few shards of shaved Parmigiano-Reggiano to finish it off. If you are city-bound and need a jumpstart to your diet, or just want to amp up your workout performance, pick up one of these cookbooks. Can a Vegan Be a High Performance Athlete? 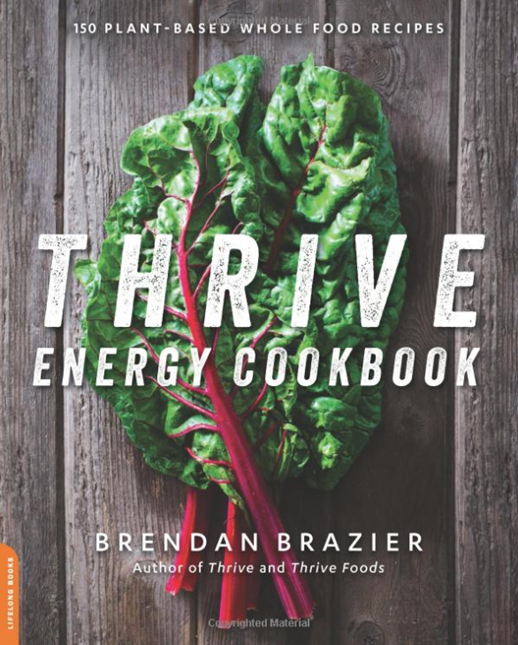 Canadian Brendan Brazier’s fourth in his series of health-minded books, the Thrive Energy Cookbook (Perseus Books 2014) is perfect for those in high performance training who may be on a plant-based diet or even for those looking for meatless options. As a former Ironman competitor and two-time Canadian Ultra-Marathon Champion, this high-intensity athlete doesn’t sacrifice taste to get the results he wants. As Head of Nutrition for the Garmin-Sharp Pro Cycling Team and creator of Vega, a fantastic award-winning line of whole food nutritional products, he’s expected to please picky athletes. Celeb clients Hugh Jackman, MLB All Star Brian Roberts, and Olympic Gold Medal triathlete Simon Whitfield, follow this regime for optimum performance. 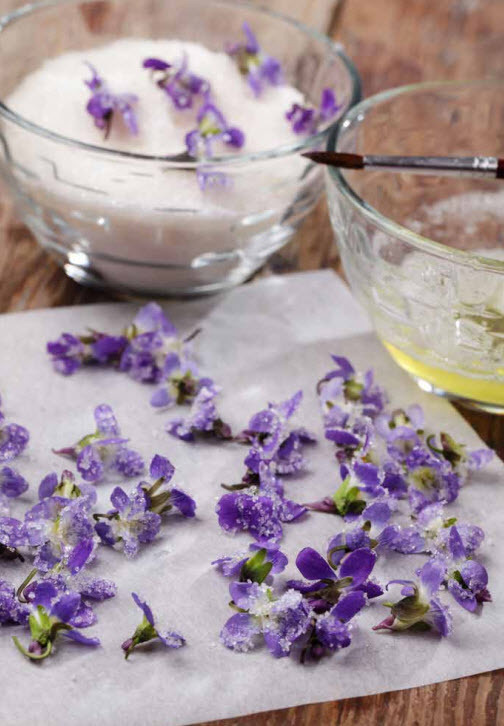 The book has 150 plant-based recipes, a pantry list of must haves, and tons of colorful photos. Okay, what fruit or veggie isn’t colorful? Brazier leaves out yeast, wheat, meat, dairy and refined sugars, but doesn’t neglect desserts, smoothies or power-packed veggie shots. This was one of the hardest books to choose a recipe from, since they are all quite original and delicious. But here’s one that should make your summer a whole lot cooler. In a blender, combine all the ingredients except the ice. Add ice to about 1 inch (2.5 cm) above the liquid line. Blend on high speed until smooth and creamy. 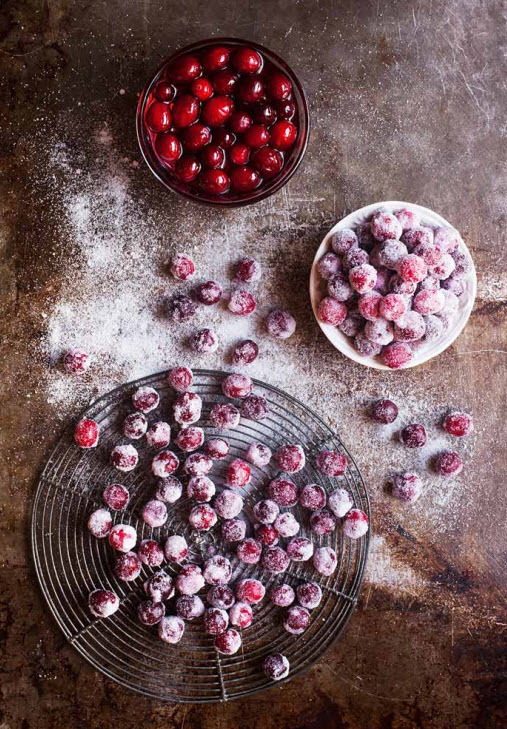 If using frozen fruit, use less ice. 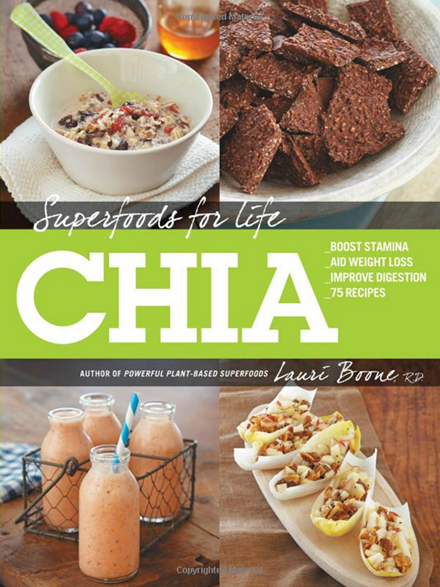 Superfoods for Life, Chia by Lauri Boone (Fair Winds Press 2014) is a 75-recipe book jam-packed with doable ideas for using chia seeds in your daily diet. High in fiber, protein, minerals and essential fatty acids (They’re the good kind! ), this tiny seed is cropping up everywhere these days – – in kombucha drinks, crackers, cereal and baked goods. And it’s no wonder. Known as an inflammation fighter and natural source of potent omega-3 fatty acids along with other nutrients, chia seeds can boost stamina, aid in weight loss and improve digestion. Le Pain Quotidian serves it up in puddings and Boone offers a few tasty options for making yours at home including a no-cook one for chocolate lovers. Boone gets her street cred as a Registered Dietician, raw food instructor and writer for One Green Planet, Self and Oxygen Magazine. She has appeared on CNN, BBC Radio and NPR and blogs regularly about a holistic approach to health and wellness. And we’re all paying more attention to that! 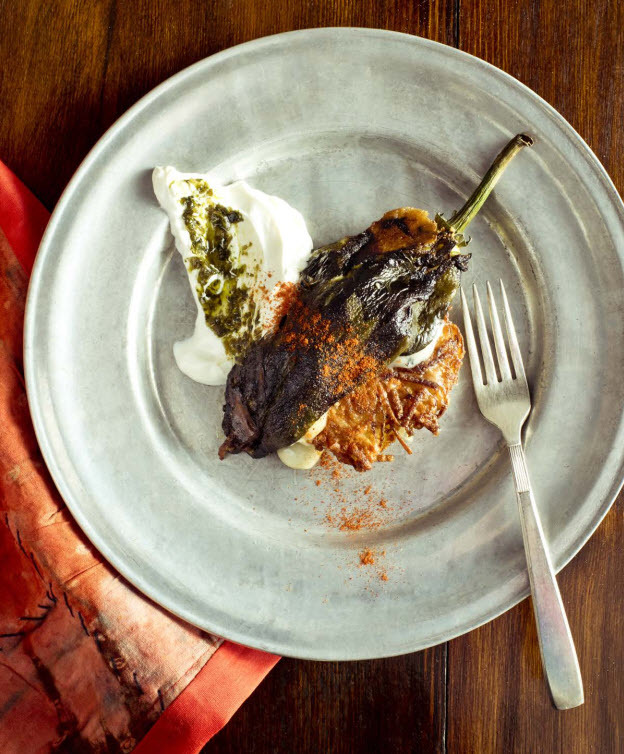 Here’s an easy recipe from Boone’s cookbook. This is an incredibly simple and decadent sweet treat combining smooth and creamy dark chocolate with crunchy chia seeds, dried coconut, and lemon zest. I like to use dark chocolate chips, which have a higher percentage of heart-healthy cacao than other varieties, but feel free to use your favorite chip, including nondairy chocolate chips or carob chips. Melt the chocolate chips in a small saucepan over medium heat, stirring occasionally, until smooth and creamy. Remove from the heat and stir in the dried coconut, chia seeds, and lemon zest. Spread the thick mixture into an even layer on a baking sheet lined with waxed paper. Freeze until hard, about 30 minutes. Break into bite-size chunks. Store in an airtight container. It may seem that an entire book on yogurt may be overkill. But I assure you it is not. Sonia Uvezian knowledge of the tasty dairy product originates with her upbringing in Armenia and Lebanon, both of which incorporate yogurt in their daily diet. 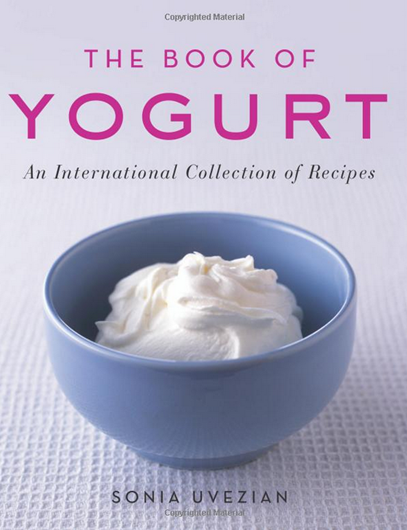 In The Book of Yogurt – An International Collection of Recipes (HarperCollins) she has compiled both old and new recipes using yogurt. I especially like her Chilled Cherry Soup for summer and Ghivetch, a Rumanian veggie casserole that uses 12 vegetables plus grapes and greengage plums. Though the book has been out for a while, I thought it would add to the health-consciousness of this scribble. 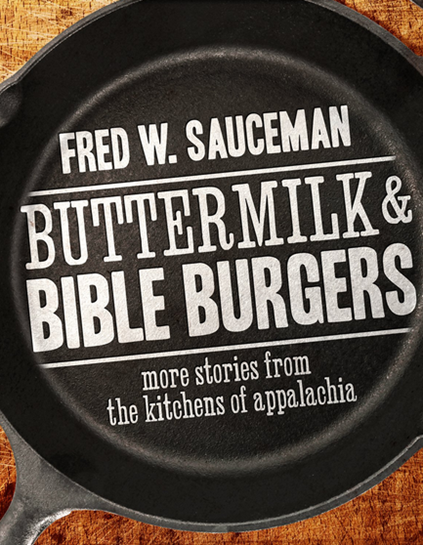 Fred Sauceman’s Buttermilk and Bible Burgers: More Stories from the Kitchens of Appalachia (Mercer University Press 2014) is the latest for author, NPR radio broadcaster and college professor whose celebration of the American South is legendary. I’ve already seen most of his documentaries, “Red Hot Dog Digest”, “Mountain Mojo: A Cuban Pig Roast in East Tennessee”, “Beans All the Way: A Story of Pintos and Persistence”, “Smoke in the Holler: The Saucy Story of Ridgewood Barbecue” and “Ramps & Ruritans: Tales of the Revered and Reeking Leek of Flag Pond, Tennessee”. The titles say it all. The 57-year-old’s love for the rural, most especially the backwoods and backstory of Appalachian foodways, is infectious – like riding down a dusty road in the cab of an old pickup listening to a country boy spin stories. Just hearing him honor the food culture and traditions of South is as satisfying as seeing a curl of smoke rise up off a rack of ribs at a roadhouse. A native of Greenville, Tennessee, Sauceman is Senior Writer and Associate professor of Appalachian Studies at East Tennessee State University. He’s also known for his radio appearances on “Inside Appalachia”, a radio program produced on West Virginia Public Broadcasting, daily newscasts on WETS-FM/HD and “Food With Fred” which appears monthly on WJHL-TV, the CBS affiliate in Johnson City, TN. 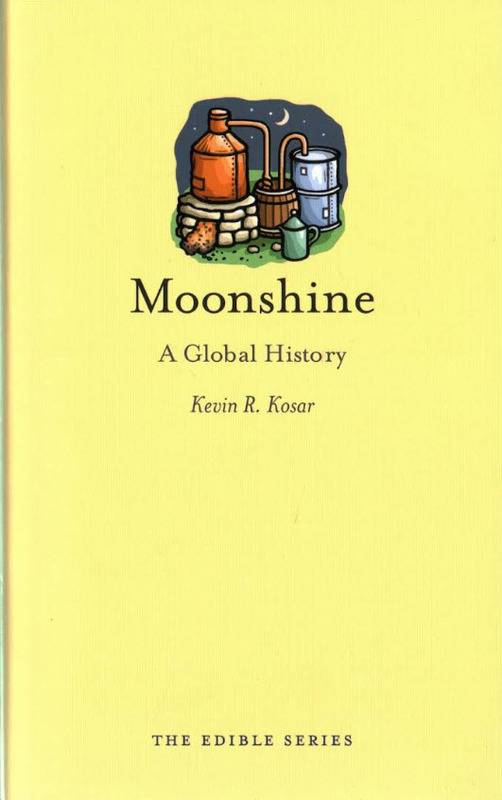 He is also a regular contributor to the Southern Food and Beverage Museum of New Orleans where he writes for the museum’s magazine Okra. His three-volume book series entitled “The Place Setting” Timeless Tastes of the Mountain South, From Bright Hope to Frog Level”, was also published by Mercer Press. 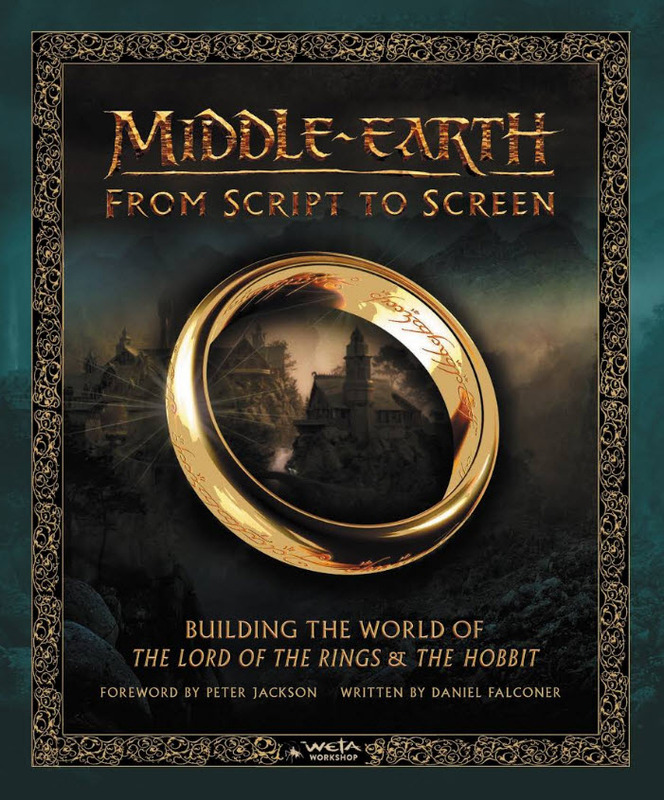 Recently I interviewed Sauceman by phone in anticipation of the release of his latest book. 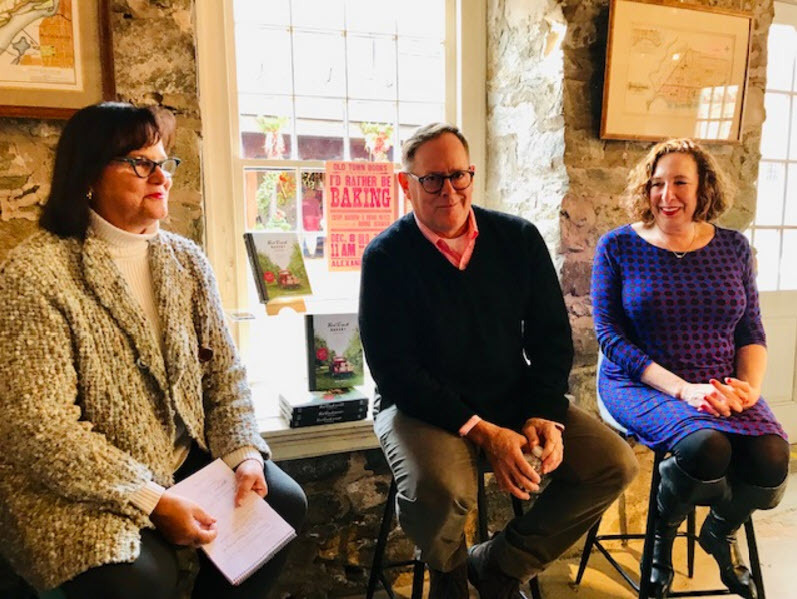 Whisk and Quill – How many years have you been teaching and chronicling the food ways of Tennessee, Virginia, North Carolina and Kentucky? Fred Sauceman – I’ve been writing about food-related topics since the mid-1990s and taught American Literature courses in the past. 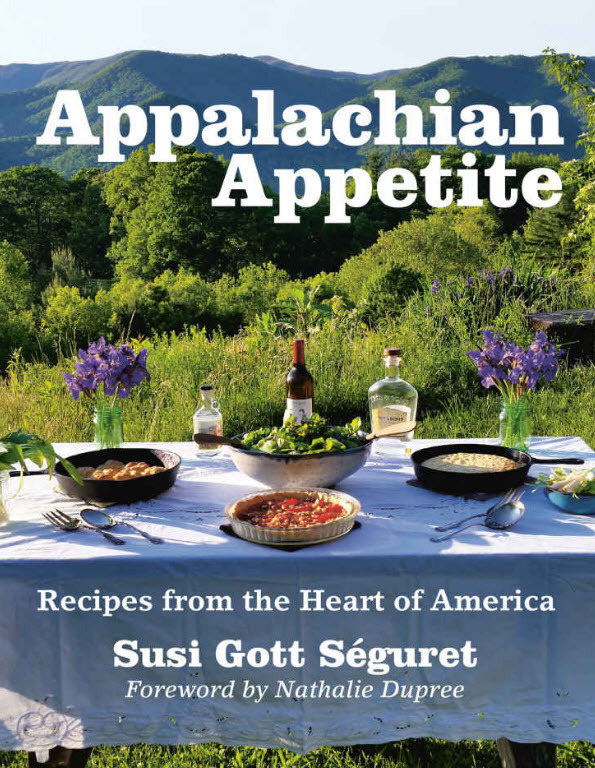 In 2005 I began offering a first-of-its-kind course entitled “The Foodways of Appalachia”, which has become the most popular course in Appalachian Studies at ETSU. W&Q – What are your other writing outlets? 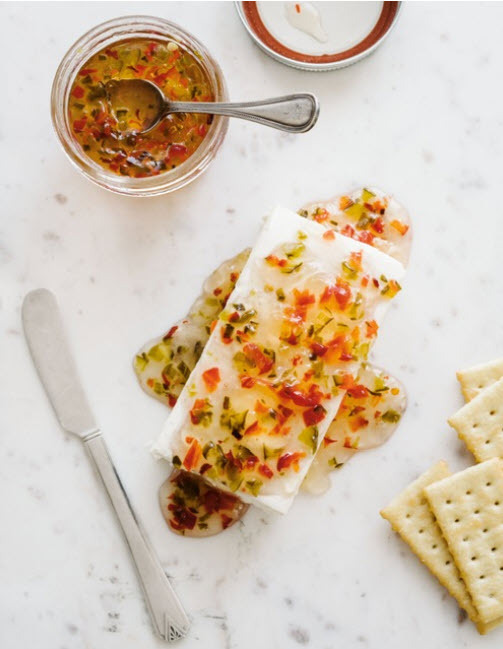 Sauceman – There are a number of publications I write for, among them the Johnson City Press where I have a monthly food column, “Potluck”, as well as the “Flavors” page for Blue Ridge Country Magazine. 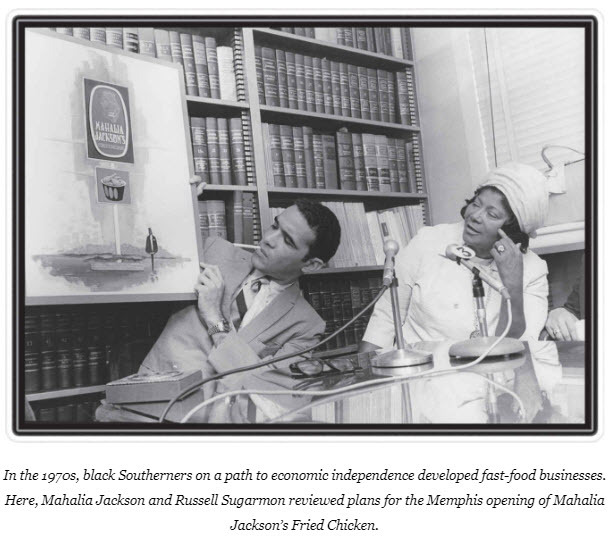 W&Q – What is your connection to the Southern Foodways Alliance? Sauceman – In 2010 edited the organization’s book “Cornbread Nation 5: The Best of Southern Food Writing”, and created the book Home and Away: A University Brings Food to the Table” in 2000. 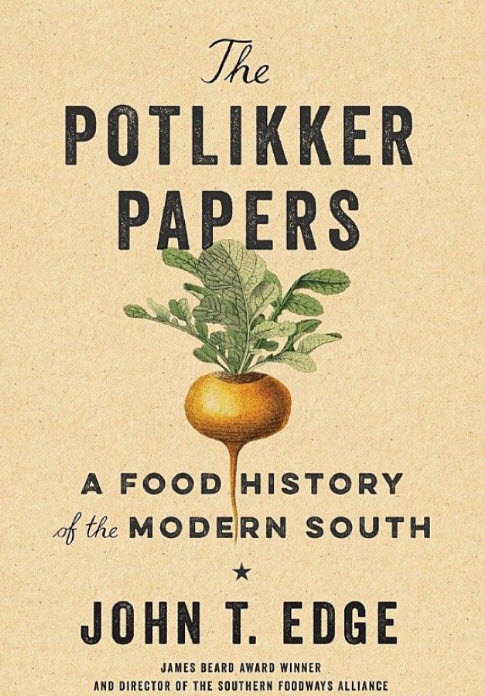 In 2010 I was one of the authors of “The Southern Foodways Alliance Community Cookbook”. W&Q – How many years have you been in radio? Sauceman – I started in radio when I was 15 with a rock and roll program on Saturday and Sunday nights. Later I became a country music DJ while working on my degrees. I also worked in television news with the ABC affiliate in Kingsport, TN. W&Q – How can people order your DVDs? Sauceman – Through the university at www.ETSUstore.com. W&Q – What’s your favorite BBQ joint? Sauceman – The Ridgewood Barbecue in Bluff City, Tennessee. 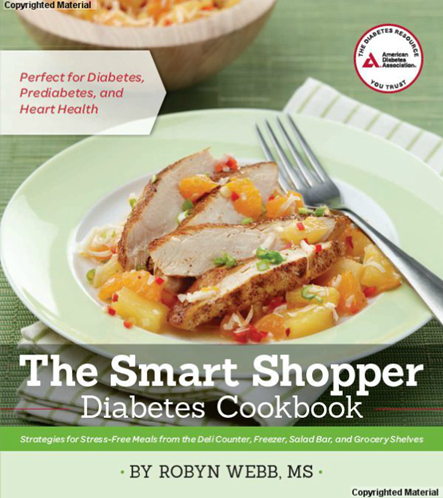 Robyn Webb’s The Smart Shopper Diabetes Cookbook offers real time strategies for making stress-free meals. Designed with the harried home chef in mind, the book sources ingredients from the deli counter, freezer, salad bar and supermarket shelves to put a healthy meal on the table in no time flat. It comes with the stamp of approval from the American Diabetes Association. As an author, nutritionist and Food Editor of Diabetes Forecast, Robyn already has fifteen cookbooks under her belt and is a two-time award winning author of The Diabetes Comfort Food Cookbook. 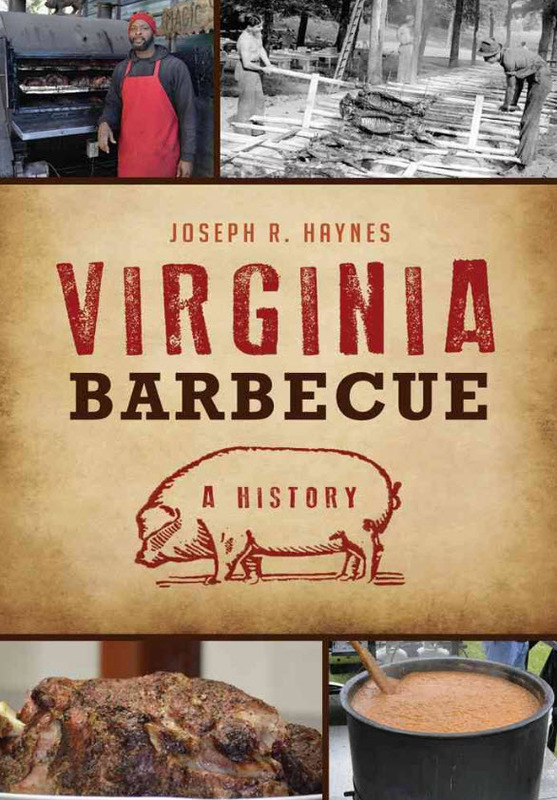 She has also appeared on Martha Stewart Radio, Food Network, Discovery Channel, CNN, ABC, CBS, ESPN and more, and as a local food writer her work has been highlighted in the Washington Post along with a ton of national magazines. A resident of the DC Metro area, she conducts cooking classes, speaks to groups on nutrition, and even caters special events keeping in mind those with diabetes, pre-diabetes and heart conditions. 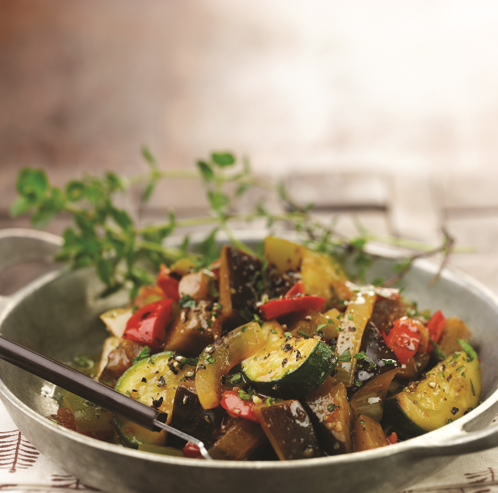 Here’s a recipe for the perfect cold summer side dish. Or serve it hot with melted goat cheese on top. 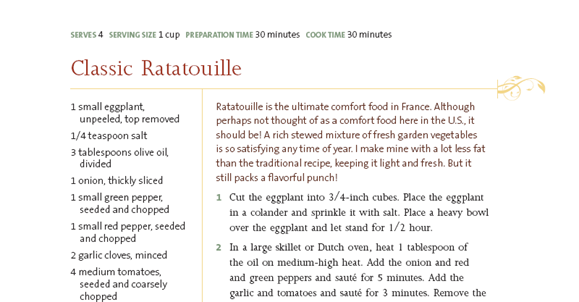 I might try it as a main course with a fresh green salad and a bowl of Robyn’s Ginger Honeydew Soup to start.